When it comes to tooth restoration, dental crowns are amongst the most popular treatment option. This procedure is ideal for restoring discolored, chipped, or cracked teeth. Unfortunately, the process of installing a traditional crown usually requires multiple dental visits, comprised of getting dental impressions, temporary crowns and then fitting the permanent crown. Although the process is time-consuming, the crown is nearly undetectable, and when it’s all said and done, you’ve restored your beautiful smile. However, advances in dentistry have streamlined the dental crown process to allow us to complete it in just one day. There are two undeniable truths that exist when it comes to dental work. First, dental problems can lend themselves to insecurity in most people. Second, those who need dental work done want the process to be as effective and efficient as possible. These two maxims have led to the creation of one-visit crowns, also known as CEREC crowns. This soon-to-be new standard in dental appliances is made possible by “CAD” (computer-aided design). The role that computer-aided design plays in tooth restoration is two-fold. Instead of sending a tooth impression to a lab, dental practitioners can enter the same impression data into specialized computer software. Then, your dental team uses this data to create a customized dental crown for the patient, often in as little as one hour. A milling machine facilitates the fabrication process, which produces the customized dental appliance from a single block of ceramic dental material. The biggest difference between traditional dental appliances and CEREC crowns is the type of materials used to create them. CEREC is all-ceramic while traditional dental appliances are an amalgamation of porcelain and metal, or, in some cases, all metal. Your dentist will numb your tooth. Your tooth will be shaped to accommodate the crown. An optical impression is taken of your tooth and uploaded to computer software. The computer software will propose a tooth design, based on your dental impression. The computer software will engage a CAM milling machine, which, in turn, grinds a ceramic block to produce the crown. Your dental practitioner will cement the permanent crown to your tooth. You go home with a restored, confident smile! Technology is playing a significant role in our lives, and now it is helping improve our smiles and self-esteem. If you have been putting off a dental restoration, you owe it to yourself to at least speak with a dental practitioner, who can evaluate the condition of your teeth, make recommendations that work with your budget, and completed in the least amount of time possible. 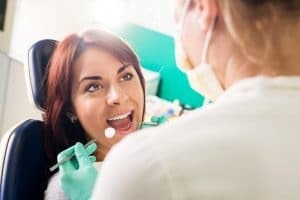 The dental industry recognizes that many people have a degree of dental anxiety, so these procedures have been developed to make the process less scary, painful, and time-consuming than they used to be. Call us to schedule your consultation today!